In anticipation of the forthcoming documentary Mademoiselle C, which reveals the candid life of Carine Roitfeld, we chart the underexposed documentaries that have given us access to private codes and rituals of the fashion world. From Leigh Bowery to Don Letts, these are the cult moments that will always remain relevant. 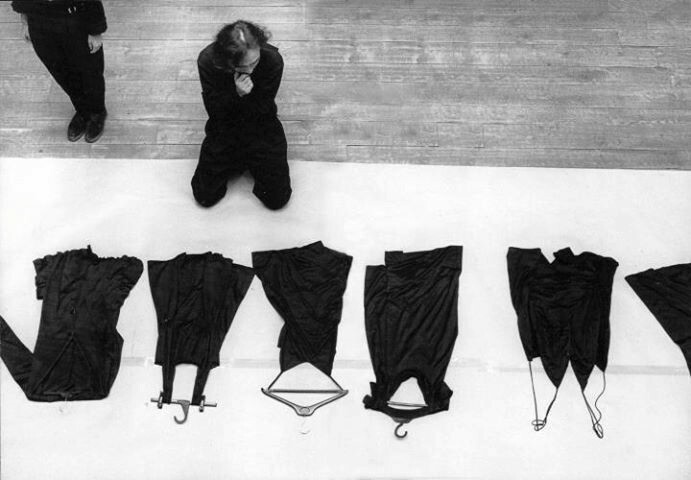 The cult at its finest: as Yohji Yamamoto prepares for an upcoming show in Paris, Wim Wenders captures the reticent designer in what is commonly a habitually private scene. An insight not just into the show, but the contemplation of the creative process: cities, cinema and identity that all play a definitive role in the final outcome. Leigh Bowery: indisputably an embodiment of the 1980's club scene in London and a provocative influence for a generation of artists. The creator of Taboo – in more ways than the infamous nightclub – injects an outrageousness that inspired Boy George, Damien Hirst, Rifat Ozbek... the list goes on. The list is topped off with Charles Atlas, the man behind the camera for this amazing documentary. Released to mark the anniversary of Lee McQueen's passing, this documentary engraves his name in a light beyond the familiar catwalk. Following his journey through Saville Row and St Martins to the impact of his incredibly potent relationship with the late Isabella Blow. A revealing and emotional tribute to the man behind the legacy. Just under twenty years later and we are graced with faces and beyond of the supermodels who disputably still reign today. This documentary gives us a rare opportunity to follow Christy Turlington through one fashion week on the catwalk for Lagerfeld, Galliano, Armani and off with Naomi and even a doe-eyed Kate. The man who invented the supermodel and revolutionised fashion in the early 90s, Gianni Versace, was sadly killed in 1997 at his Miami home. This documentary reveals the events leading up to his death and the butterfly effect of his unfortunate passing. John Galliano's rollercoaster career is documented in a feature film at its glorious height. Retrospectively, perhaps, summing up the nostalgia of The Great at his greatest. It's not often that we get to see the darker side that exists within model casting. The sadness behind the smiles is ever-present as we follow casting director Ashley Arbaugh through the 'supply chain' of Eastern Siberia: thousands of pre-pubescent girls vying for a moment with a modelling agency. Jeremy Scott, Proenza Schouler, Versace, and Jean-Paul Gaultier have all lent their ateliers to the fantastic camera crew (headed by French director Loïc Prigent) for the 24 hours leading up to the debut on the runway. 'The Day Before' – on this occasion – is spent with French designer Isabel Marant. We are still obsessed by subculture. And so are they; they being the designers of 80s and 90s who are still ruling today and keep nodding back to the underground tendencies from that era. This documentary analyses quite a drastic movement away from that glam of the 80s, a casual style driven by football hooligans and onwards into a rave culture depicts dressing down, but with plenty of ups. How did NYFW start? The tents at Bryant Park were home to an established New York Fashion Week only after journalist Suzy Menkes was met with a bump on the head from a chunk of roof and proper venues were ushered in. The tents sprung up and were soon hosting a bevy of press in a proper front row. The clandestine world of haute couture is not the easiest to infiltrate. Here, the BBC provides access to a story not often told. How much does haute couture actually cost? Who are the people behind the pocketbook?